There are not a lot of restaurants in the world that are over 250 years old. Tamahide in Ningyocho was established in 1760, and is not only old, but also the birth place of a common Japanese dish called Oyakodon. It was introduced here in 1887 and it is still one of the best places to eat it in Japan. The current characteristic white restaurant building was built in 1883. 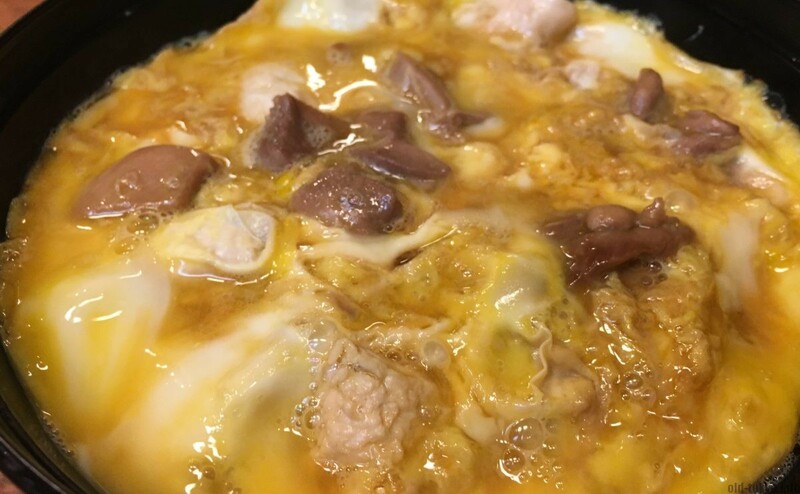 Oyakodon is a mix of egg and chicken meat on rice. 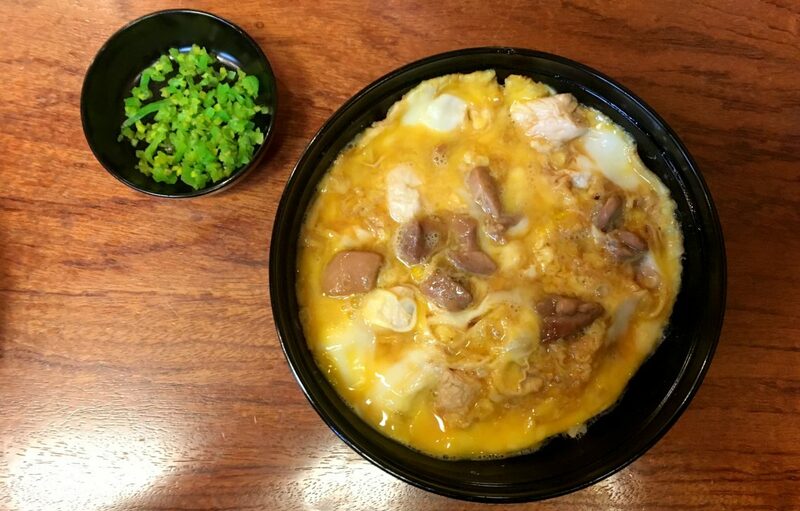 Oyakodon means in Japanese parent (oya) and child (ko), served over rice (don). It is a simple dish with all ingredients simmered together in a sauce and then served on top of a large bowl of rice. People lining up in front of the restaurant on a Saturday morning. Tamahide started out as a place for the preparation of chicken and became specialized in shamo-nabe, a hot pot with gamecock from northern Kanto. Oyakodon was invented here by the recommendation of a customer in 1887 to do something with the leftover pieces of chicken and broth after the nabe meal. In 1891, it was the wife of 5th generation chef, Toku Yamada, who came up with the idea of making it into a separate dish. Even though it was only available as a take-out item, it soon took off and spread throughout the whole of Japan. You will see her photograph on the right side when you enter the restaurant. Currently, it is the 8th generation of the Yamada family that is running the restaurant. So why is this place so good? Over the years I ate a lot of oyakodon in Japan, and I was very curious how this one would measure up to all those dishes I’ve had before. I was hoping that it would be delicious, and that was completely true. I ate my oyakodon bowl rather quickly actually. For me the deliciousness was due to the broth, the way the eggs was served in a half runny state and then the pieces of chicken (both dark and white meat) that were all very tasty. The good thing about Tamahide is that despite its fame, it is still possible to eat an inexpensive lunch. For JPY 1500 you can have lunch, which is in Belgium and I guess many other countries on the cheap side in order to have lunch inside a restaurant. I lined up on a weekend on a Saturday morning. I estimate more than half of the people that were lining up were Japanese. The rest were Asian tourists (I could hear Korean and Chinese), no Western tourists. I guess about 30 people were already waiting when I lined up at 10:55, but very soon the line doubled in size to over 60 in about 5 minutes. It seems that 11:00 is the time most people are aiming for if they want to have an early lunch here. Start lining up from around 11:00. In order to not hinder the pedestrians, they ask you to form a line with only 2 persons next to each other. A person from the restaurant will confirm with how many people your group is before entering the restaurant. There is a menu available at the entrance that you can take before lining up (menu only available in Japanese). 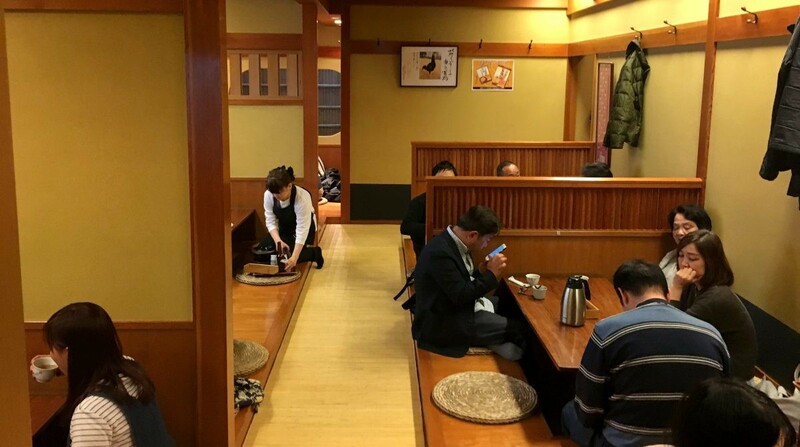 People could enter the restaurant from 11:20. After you enter the building, you will need to take off your shoes. Staff will stow your shoes away and you will receive a tag in order to retrieve them later. Then you will need to line at a small counter to order your food. You need to order here instead of at your table. Please note you cannot use credit cards. If you do not speak Japanese, they make it rather easy for you with large photos of the food so you can just point. You will then be guided to your table. If you are alone or with 2 persons, you will have the risk to be seated at a larger table (of 4 persons), which can make conversation awkward. I was lucky to be seated at a 2-person table. I guess that was thanks to lining up extra early. After you have finished your meal, follow the instructions of the staff to go to the exit, as there could be many people still lining up, you might not be able to go the same route as you came in. At the exit you can retrieve your shoes with the tag you received when coming in. You can also make a reservation for lunch time. In that case you do not need to line up and you can go directly to the entrance. However, you will need to pay more than double for your oyakodon as these courses start from JPY 3300. Another option would be to eat this dish at their other store that opened in 2012 in Solamachi (at Tokyo Skytree). Inside of the restaurant. Not to worry, you can extend your legs under the table. Budget? cheapest lunch option JPY 1500. It includes soup and tea. Lunch courses start from JPY 3300, dinner courses from around JPY 7000 (without drinks). When to best visit? If you just want the basic lunch, you will have to line up (for lunch reservation, you will need to order a more premium lunch set starting from JPY 3300 per person). Why visit? The best oyakodon in town, from the restaurant that created the dish.